Think I understand where you’re coming from. Recently I was asked to ‘say a few words’ at a retirement function for a friend and colleague. We’d started our careers together at a tough Western Sydney school that we both regard as the making of us as teachers, professionals and people. There were more than a few words shared and a PowerPoint of images of places that adventure in education had taken her – which included an extended contract in Africa before returning to country schools here. I’d observed that our first school community was never going to contain her – she was destined and ready to explore horizons far beyond our foundation years as strugglers, eager to find our own way. Frameworks like SMART goals have always been guidelines for me – starting points to steer a way to play the game & develop approaches that best suited the students we taught and influenced. There were ‘kids’ from my friend’s last schools at this retirement event – they were smart, funny, appreciative, from a range of ability levels but you can be sure that what they had accomplished as a direct result of their school years could not be measured by one set of tests or targets. I hope you will be able to find a way to make any frameworks that stand in your way, work for you and your students and that you are fortunate enough to have people who push, prod and encourage you to take full advantage of opportunities within your reach. Thanks Lynne. I can definitely relate. I guess I feel a little bit like a caged bird – not sure where I’d like to fly to, but I’d like to explore without being judged and held too accountable to have ‘results’. 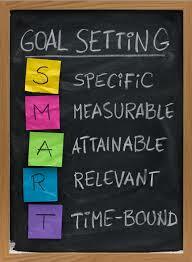 Maybe your SMART goal shoul be to implement 1 innovatation to your classroom practice by the end of year. Of to find emerging uses of tech to be presented to school. You can add conferences like this to your PL request based on this. Just a thought! Great idea, but then it’s not specific enough. Believe me, I’ve tried to cover all bases, but I need to name the ‘thing/innovation’. Hard when you don’t know what you don’t know! Oh I like that! I’ll remember that for my next SMART goal cycle. I worry that sometimes my leadership doesn’t want my career to develop too much in case I suddenly know more than them.